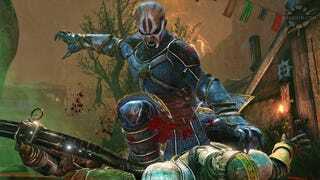 I wasn’t expecting to enjoy Nosgoth. In all honesty I only loaded up the beta because it was free and my love for Soul Reaver is strong. A few evenings later and I find myself returning to it because I want to, and not just because I need to play it to write about it. There’s a few reasons for this. Firstly it’s a fluffy bit of casual fun: the kind of thing you can load up for a few games as a diversion, rather than take seriously (case in point: I played a few rounds last night while waiting for something else to download). The gameplay is immediate and simple, with compact maps and fairly instant action. The rigid structure that sees you play one round as a human and one as a vampire also keep things moving along nicely. The other thing I find appealing is the asymmetrical nature of the combat, which keeps the bouts interesting by switching you between superhuman but weaponless vampires, and tooled up but easy-to-squish humans. It really recalls that AVP style of differently balanced teams. The vampires can climb any surface, leap across half the map but only use melee attacks. While the humans have ranged weapons, grenades and other tools but are stuck on the ground. As a vamp you feel preposterously overpowered at first, hunting across rooftops or pouncing several hundred yards to savage whoever falls under your sights first. You still have to hunt in packs, as a lone player can still be quickly dispatched by a couple of humans, but the sense of being a superior predatory beast is strong (if not necessarily true). As a human on the other hand, you’re more likely to band together, nervously scanning the rooftops and backing into corners. The strength of each side seems to come from the teams, rather than the races. If the human side can hold it together when the vampires attack, it’s hard for the undead to gain any ground. If they scatter, or instead play without cohesion , then it’s easy to be literally taken apart. That last bit is probably the only aspect that does feel unbalanced. Vampires have a very slightly easier time with a team that doesn’t work together because of their mobility and strength. While, as a human, if your team doesn’t gel, you’re at a distinct disadvantage. That one issue aside, the larger differences actually balance out fairly well. Matches are often close, with a lot of lead swapping and finishes that go right to the wire. I’ve yet to feel any clear advantage to one side or the other. At this point the beta is small, so it’s hard to really get a feel for what the full game will offer. There’s only really the deathmatches at the moment. A second, king of the hill-style mode, called Flashpoint, is included, but isn’t really doing it for me, as only the humans can capture territories. The side swap means everyone gets a turn but it feels limited on the vamp side, especially as it plays the human’s greatest – sticking together in a group – as they capture beacons. The one great untested area in Nosgoth, given the time I’ve spent with it, is the free-to-play aspect. So far I’ve only used gold earned in-game to rent abilities, gear and perks for seven days (you can also buy them outright at a higher cost). From what I’ve seen so far, the amount you earn from not-too-serious play could keep you going quite easily. The hard cash is the Runestones, bought with actual money to skip the grind. So far I’ve not seen any grossly overpowered characters or anyone who looks like they bought an advantage that couldn’t otherwise be earned. The stuff you’re buying and unlocking can be accessed through grinding and levelling up and nothing so far suggests the inventory might favour a large wallet. The economy of anything F2P is always the hardest thing to get right though so it’ll take a little more time to see how it eventually settles. So far though, I’ve spent no (real) money and had a good time which is always an encouraging start.